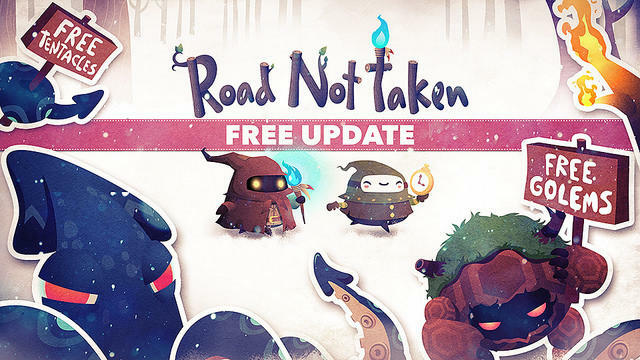 Road Not Taken gets Free Update, PS Vita Port "Failed Hard"
Most gamers were exposed to Spry Fox's Road Not Taken on the PlayStation 4 as a PS Plus title a few months back. This roguelike effort tasked players with moving about the wilderness, saving children from the cold and battling monsters. It was a self-proclaimed tough game, though perhaps a bit too tough for the massive player base that exists on the PS Plus network. Spry Fox recognized that, listened to feedback and has released a free update to their game on the PlayStation 4. Spry Fox's David Edery, CEO of the studio, detailed what's changed on the PlayStation Blog. Two big bullets from his rundown seemed especially important to me. Here they are. "Easier" mode and hard mode: many people have told us that while they love the original gameplay and the art in Road Not Taken, the game is simply too difficult for them. After chewing on this feedback for a while, we decided to split the game into two modes, Normal and Hard. "Hard" is basically our original mode with just a few tweaks; "Normal" is a new mode that is more generous with energy and has less crowded (and therefore less difficult) rooms, among other changes. In addition, checkpoints are now less punishing to use (in both modes), so players who felt like they were pointless before will hopefully find them more of a tempting gamble now. New creatures: the Forest Kraken, the Golem, and the Ninja Bear are new creatures with unique new behaviors that will now be appearing in the forest, particularly in the earlier years. And of course, there are new secrets to discover in relation to these creatures! The easier normal mode and tweaked checkpoint system are both welcome additions in my book. Personally? This is a game I want to play on the PS Vita. It was announced for the portable, but we're not sure when it's coming as of now. The bad news? Here's Edery in the comment section of that post. Vita folks: I wish I had better news for you. Our porting solution has failed on the Vita, and failed hard. We have to find a completely new solution for bringing the game over. There are no obvious good solutions available to us right now. The major issue are the memory constraints of the Vita relative to the PS4. Our porting solution is consuming way too much memory. So, yeah, don't expect that Vita version any time soon.